Which motherboards are compatible with NVIDIA GeForce GTX 1660 Ti? Best answer: As long as you have a full-sized PCIe 3.0 slot available then whatever motherboard you choose will be fine, whether it's AMD or Intel. The GTX 1660Ti doesn't require any magic hardware to run, even though it's based on NVIDIA's new Turing architecture. Since the assumption is you're building a decent spec gaming PC, basically any motherboard you pick will be fine. There's only one thing of note. The GTX 1660Ti will use a single PCIe 3.0 slot at x8 or x16 depending on your system (the longer slots if you're wondering). Even the tiny mATX motherboards will accept a GTX 1660 Ti and most pre-built gaming PCs from the last few years should be good to take one as an upgrade. Pick the best motherboard for your build and your budget. Check the specs and features against other requirements you're looking for rather than the graphics card. It also doesn't matter whether you use an AMD or Intel motherboard when it comes to running a GTX 1660 Ti. If you were ever concerned about compatibility with AMD processor like the Ryzen 7 2700X, don't be. We have some recommendations listed below, whether you have an Intel or AMD build. Of course, there are plenty of options out there, but the ASUS Strix Z390-E Gaming and the ROG Strix X470-F Gaming are both great choices and pack a balance between price and features. If you're using an AMD processor in your build, it's important to remember that unless you have the APU variant (with Radeon Vega-integrated graphics), you'll always have to connect your monitor to one of the video outputs on your graphics card. With a powerful GPU comes a higher power requirement. The GTX 1660 Ti isn't particularly power hungry, but the power supply still needs to be big enough and it's more of a concern that your choice of motherboard. The GTX 1660 Ti has a 120W TDP and NVIDIA recommends a minimum 450W power supply in your system. Of course, you also need to factor in whatever else you're using. An easy way to make sure you're using a properly-sized power supply is by using the free EVGA calculator to make sure you have enough capacity in your system. 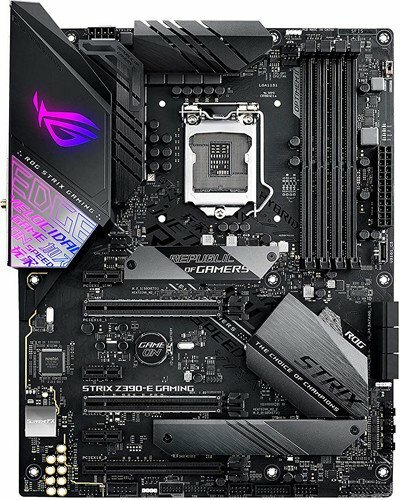 The ASUS ROG Strix Z370-F Gaming by ASUS isn't the most expensive board out there, but it comes packing some killer features for system builders. ASUS has AMD system builders covered too with the most excellent X470-F gaming which is feature packed and very well priced.